Well folks, I said I was going to do it and I meant it. Down below you're going to see the horrifying photos of "The Wall." I wanted to warn you so if any of you are squeamish or easily have nightmares, you could stop reading right here and just trust me that it's bad..well, beyond bad. It's really rather horrifying. Now, I need to explain a few things before I show you the pictures. You'll notice my youngest son in the first photo and he's wearing something that looks suspiciously like shorts. Well, they are shorts. Since y'all also know it's hellish cold (is that possible even?) up here right now, you'd probably also guess I wouldn't let him run around in shorts. Ok, this is true. I have a good explanation though. My camera batteries have died and well, all the batteries are in "The Wall" as far as I can tell. This does make it rather impossible to take new pictures. The umm..bonus?...of all this is ..well, "The Wall" actually looks worse now than it does in these pictures. See, those neatly stacked boxes aren't so neatly stacked anymore. The cats have gone in there and knocked them all over, dumping their contents and making it far more messy. 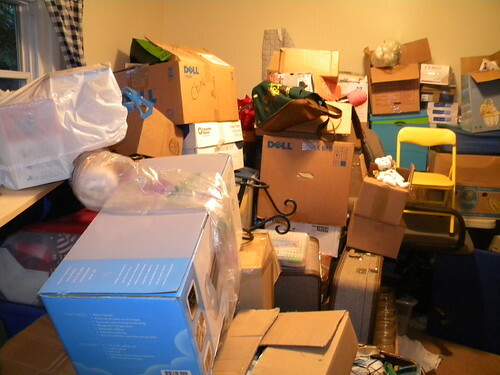 Plus, I made the mistake of moving boxes (with crafting items in them) from other rooms into "The Wall". Just trust me, it's bad. Now, the other thing that has happened is well bad too. See that nice clean patch of floor? Well, it no longer exists. Between the cats knocking things over and the kids knocking things over and me knocking things over and well, none of us picking any of it back up, that nice clean space is just gone. That's what I meant by the lion tamer comment in my previous post. 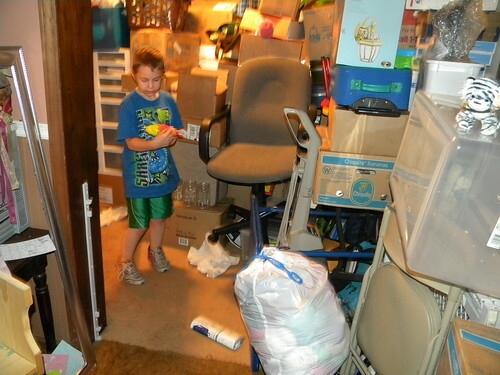 All that mess has just come tumbling out and I figure I need a chair and maybe a hazmat suit to go in there and put it all where it belongs. This is an inside view of the room...back when there was a space big enough for me to climb in there and take such a picture. I'm pretty sure it wouldn't look as organized now if I managed to get another picture. In fact, I know it wouldn't. 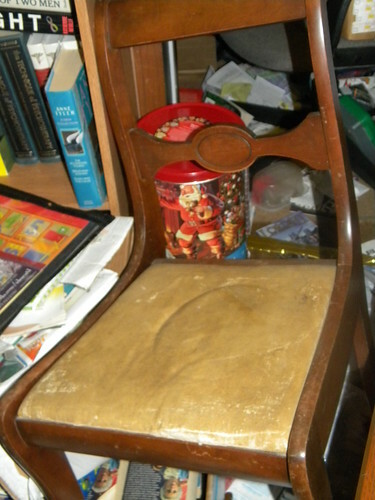 This is a picture of the chair that I redid. Y'all have seen this before, I think. It's here now to show you a small taste of what that cleared piece of floor looks like now. Just look under the chair, beside the chair and behind the chair. Now, if any of you made it this far, let me tell you that I am impressed with your cast iron stomachs. You must be the folks who love scary horror movies and surprises where people jump out at you. Maybe you're adrenaline junkies. I don't know, but I'm sure glad that you're here to hold me accountable for getting this junkyard turned into a creative haven. Katie - I think you've got me beat! I thought my basement was bad -- your "wall" is my basement's bigger badder brother! Good luck with your challenge!! Good luck Katie, I'll be rooting for ya!! Holy cow! I have been an apartment dweller for such a long time that I can't imagine having that much extra space! Once it gets cleaned out, think of all the great things you could do with it! Good Luck!! YIKES! I have seen the wall in person, and now it looks ... well, like a walkk and a half. I will be rooting for you in working on the wall! Oh my, there are a lot of boxes, aren't there?! Well, I'm sure you can handle it. So far you're doing great - just keep envisioning the end result. I can't wait to see how it turns out.